Reading Ross McGill’s blog post #GoodinTen – Requires Improvement CPD Programme got me thinking, his posts often do. As a school we have been consistently good, for the past decade, with increasing amounts of outstanding reported in each consecutive Ofsted Inspection but we are stuck at good. Good with many outstanding elements still equals good. The quality of teaching has got better and better, over the years, with more outstanding teaching observed through our formal lesson observation programme. However, we have teachers who have consistently been graded as delivering good lessons and they are utterly frustrated at not yet having achieved a “coveted” outstanding grade. They are also stuck at good. In this blog post I want to focus on this group of teachers. They are hugely committed to their students, the school and our profession but need tailored support to take them the next step to outstanding. Why do you think your lessons are graded outstanding rather than good? What helped you move from delivering good lessons to delivering outstanding ones? If I asked you what ten things do teachers who consistently deliver outstanding lessons do, what would you say …. ? … those of you who have already spotted this as a trick question are on your way to outstanding as my rather limited piece of “research” identified only two consistent themes not ten and this is key. I’ve been using the same “tool” for assessing lessons for about eight years and it is used throughout the school. Various Ofsted frameworks have come and gone but I’ve stuck with it – the Ofsted posts might have moved, and will move again, but the goals of a lesson are unchanged – gains in learning and engagement (the percentage of students making these gains). In outstanding lessons almost all students make substantial gains in learning. In numerous good lessons I have had the pleasure of observing over the past twenty years, as a headteacher and prior to that as a deputy and Head of Science, there has been a great deal of work put into carefully planning the observed lesson. Thought has been given to the content of the lesson in terms of learning gains and a series of activities have been planned for the students. The learning gains and lesson structure have both been tightly defined and the plan effectively implemented. In these good lessons there is a balanced approach with both the learning and lesson structure tightly defined. The teacher delivering the good lesson too often sticks to the plan and this becomes the limiting factor. As Tom Sherrington (@headguruteacher) points out lessons need agility. Too often I have also seen mediocrity grabbed from the jaws of greatness as the teacher sticks to the plan too rigidly. The lesson descends into a series of activities with fixed, inflexible timings without sufficient attention paid to the learning. A classic example is the lovely little assessment for learning activity sensibly placed in the lesson to gauge progress, however, following its completion the teacher moves on to the next activity with no regard to the answers given by students. These satisfactory or sometimes inadequate lessons often have a tight lesson structure, activities and timings, but loose focus on the learning. I’ve started summarising this in the table below. When chatting with the teachers who had consistently delivered outstanding lessons, at St. Mary’s, they often rather sheepishly admitted that they didn’t have very detailed lesson plans. 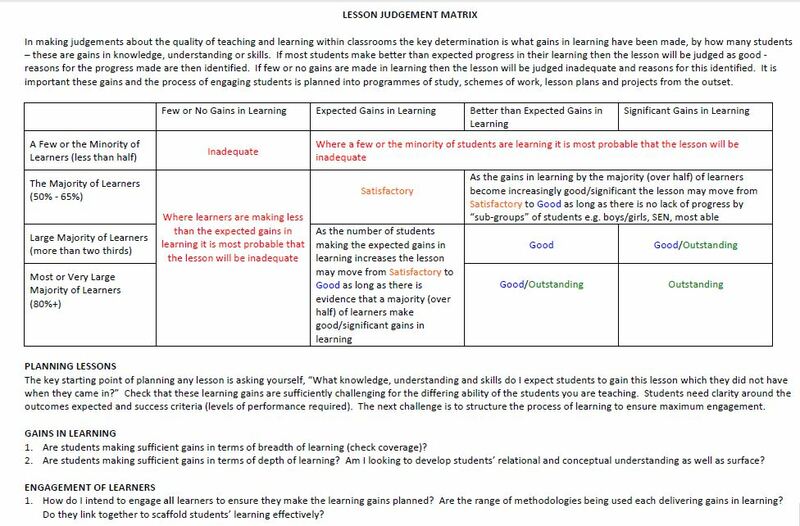 What was obvious though is their lesson planning was meticulously in terms of clearly defining the learning gains they were seeking. The lesson structure was deliberately kept loose because they wanted to respond to the learner rather than following a pre-determined plan. They had a pedagogical tool kit they used, which had developed over time, that they employed as and when needed. They tended to be more discerning about what they did and didn’t take from professional development sessions: using some Kagan, some graphic organisers/thinking tools, a number of the 5Rs – “you nearly always have reasoning in a Science lesson” – whatever would help learning without trying to cram a tick list of things into a lesson. One consistent idea they all used was the SOLO Taxonomy to help them structure the learning and move students to deeper learning in and across lessons. The teachers who consistently delivered outstanding lessons had a significant and coherent view of learning within their subject and worked at a conceptual level. They focused on using knowledge and skills to develop a student’s deep conceptual understanding of the subject or alternatively worked at a conceptual level with students and then linked the necessary knowledge in. 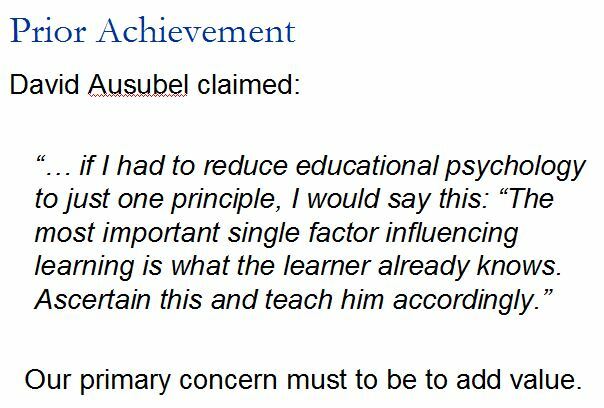 This corresponds with work published by John Hattie which placed “Teacher Clarity”, explicit identification of learning intentions and success criteria, as a strategy that was 8th in his list of interventions that had a positive impact on attainment and achievement. One colleague reminded me of a challenge I had once given to the staff to teach their whole GCSE or A-level course in the first two weeks of September and then move into the detail later – you can only do this by teaching a conceptual framework. I’ve blogged before about the use of the SOLO Taxonomy and the need to be able to tweet what your subject is about. One teacher described their “no faffing about, no pointless activities just a relentless pursuit of learning”. She has already finished the term’s work, as outlines in the scheme of work, whilst other colleagues are worried they won’t have enough time. Teachers who deliver outstanding lessons think differently but sometimes don’t realise it – they work both within their subject and pedagogy at a conceptual rather than a relational (how the bits link to each other) level. The second common strand identified in the conversations was from the start, through the lesson and at the end students’ learning needed to be visible to them so they could respond. This response could be to go back a step to underpin gaps in students’ learning or move at pace through the whole of the learning planned for that particular lesson in the first twenty minutes and onto the next stages in students’ learning. The teachers who delivered consistently outstanding teaching responded to the learners. They kept their lesson plans loose and where more than happy to leave the plan behind if it helped the learning. This assessment of learning took a number of different forms including: an examination question based on the lesson’s learning done at the beginning to identify what students already knew and didn’t know for the teacher. She returned to the examination quaestion at the end of the lesson to check that students had made learning gains and reinforce to the students the gains made. Another was a consensus map completed after simply reading a poem and again throughout the lesson as the poem was analysed and layers of meaning explored. These are simple techniques that teachers can use but you need to have the confidence to move away from the plan and respond to the learner not just follow the activities. As with most of my “research” I think I’ve just discovered what we already knew but now it is clear in my mind, I own it in a way I can now make use of. Absolute clarity of how knowledge and understanding are vertically integrated in your subject and helping students to work at a conceptual level. The teacher needs to be thinking here first. Keeping the lesson plan “loose” so that you can respond to the learner as s/he makes their learning visible to you at the beginning, during and end of lessons. The last assessment forms the new starting point for the next lesson. Having spent the week looking at the what, I’m beginning to move to the how. 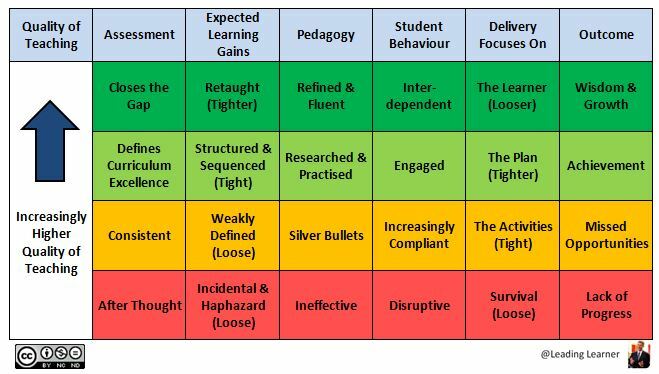 What programme would I put in place to help staff get the coveted outstanding lesson grade they have never previously achieved? If we can get there for one lesson, can we move to consistently outstanding lesson and then to becoming a great teacher over time. My plan for the week is devise a ten week, ten activity programme (following the lead from @TeacherToolkit #Good In Ten) plus ten weeks of working collaboratively as a teaching and learning community to refine their skills. I want this programme to help move a consistently good teacher to their first outstanding lesson grade. The follow up post to this “Next Step to Outstanding” starts to lay out the basis of a professional development programme and has a couple of resources to download that you might find useful. Thanks to Helen, Jenna, Jenny, Louise & Stephen for their time and sharing their great practice with me. Some interesting ideas – I really like your table. Thank for the comment David. I had read your post earlier in the week and knew I would be in difficulty with the performance, learning or progress issue. I have no defence just used the term that I tend to use as a bit of a catch all. I agree with David – a really interesting blog. I was that very teacher for a frustratingly long time. My answer was to eschew the gimmickry filled courses, and some of the lesser pedagogy tips, which serve only to promote tools rather than actually focus in upon core pedagogy. Your point that feedback – making the learning visible – is paramount is supported by a wealth of evidence and does reinforce the idea that the shift from good to outstanding is about the deliberate practice of our core practice. Like Dylan W says, we should stop doing so many good thing’ and focus on our core practice. The ‘holy trinity’ I argue is great explanations (with modelling being a key component), questioning and feedback. That is entirely true. I would argue the principles of great teaching are as old as education itself. Faddish and false interpretations of outstanding teaching, such as the current criticism of teacher talk almost without qualification, are ill considered and daft! 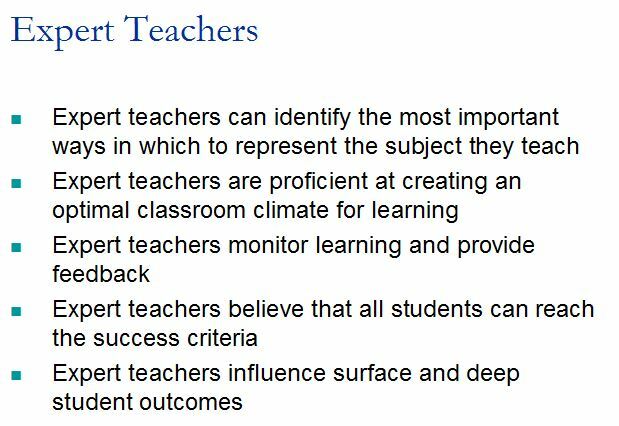 The other key issue is the nature of how good teachers undertake their practice. Too many teachers simply undertake repeated practice when they are beyond their NQT year. This can often serve to reinforce errors if there is no quality regular feedback. We need to undertake deliberate practice, with deep, typically time-consuming reflection. A couple of years ago I endeavoured to read everything I possibly could. I expected it of my top students aiming for university, but I had hypocritically stopped doing it myself. It was an important beginning in the reflective process. That deliberate building of a knowledge base, followed by lots of committed (often annoying!) practice takes time and extra effort, alongside support from school leaders. To be honest, I know many teachers who simply don’t put the effort in to drill their core practice in order to make the elusive shift to outstanding. I’d be interested in how your ‘ten week’ plan works. If I were to undertake a ten week plan – hypothetical I know – it would involve reigniting their research and pedagogy knowledge base (questioning many of their biases and habitual assumptions along the way perhaps) and training people how to undertake deliberate practice effectively. Anything beyond that would threaten the required time to embed deep habitual changes to practice. The learning communities could help initiate quality coaching and feedback mechanisms to complement the process. I would argue strongly that ten weeks is very much treading the beginning of the path from good to outstanding. For me, I worked solely on questioning for three times that length. I recorded and reflected systematically for months – undertaking deliberate practice proper (lacking some coaching support though). If teachers expect ten weeks to ‘solve’ the problem then I would argue they haven’t understood fully why yes have plateaued. If you get a chance to share your programme I would be really interested. Thanks. I am due to write up my Clevedon TeachMeet seminar which responds to the teacher improvement issue and many of my points above. Thanks Alex. I think your comment is a blog post in its own right. Your deliberate practice post will be referenced in next week’s post as it’s crucial. The ten week plan aims just to get someone a taste and feel of what an outstanding lesson is. The journey to being a great teacher will hopefully start with that first step. Hope you’re enjoying the new phone. Apologies for the errors – my new phone is a shocker for typing and seeing what I have written! This was flagged up in an online discussion by an NPQH participant. It’s a great read. Thank you. I’m not a teacher, but I work a lot with school leaders and I’m struck by the issue of ‘too much structure’ getting in the way of being able to respond to students’ needs. The more anxious we are, generally speaking, the greater our desire to control – so teachers ‘anxious’ to achieve the ‘outstanding’ label are more likely to hold on than to let go. 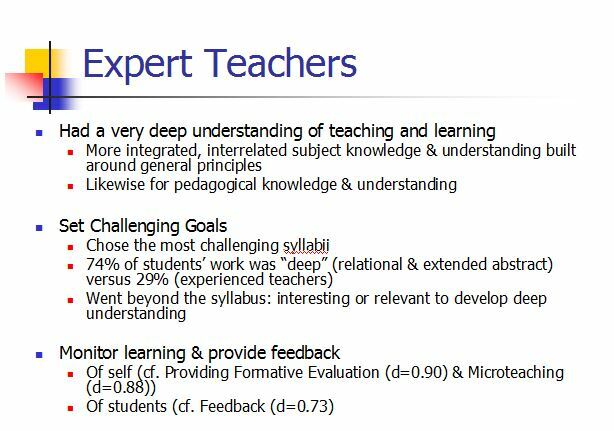 Without appearing to denigrate the skills of teachers, I really wonder if it would help to change all words associated with ‘teacher’ to ‘learner’. We already know that outstanding headteachers are actually headlearners. What would happen if all ‘teachers’ we re-named as ‘learning leaders’. Would they then focus on the learning of the students and be less self-conscious about their own teaching, I wonder? I think it might well help Julia. The frustration for some teachers of being told yet again that was a good lesson just adds to their anxiety. Learning and leading, whether in the class room or staff room, go hand in hand. Glad you enjoyed the post. I enjoyed this, Stephen – it made me think (and rethink a few things) which is what I get from the very best blogs. I get very irritated by the suggestion that independent schools have a monopoly on teacher quality – I have worked with inspiring, highly skilled and dedicated teachers in both sectors – but I do wonder whether freedom from the constraints of Ofsted judgements liberates some in the independent sector to be their best. The independent sector inspection system is rigorous but it’s a peer review model and doesn’t have the restricting effect that inspection seems to have on some state school practice. Tension around Ofsted judgements can encourage people to stick to what’s safe and ‘good’ rather than taking the leap of faith that ‘outstanding’ might require, perhaps? What do you think? Firstly, I agree that quality teachers are distributed – no matter which school, in whatever sector you will find quality. Ofsted have a part to play – they keep changing their schedule so what is “outstanding” as defined by them changes every few years, the teams are idiosyncratic in nature with consistency being a real issue and they can do long lasting damage to a school following a rather limited snapshot. I can’t do much about Ofsted so I actually wonder whether as a leader I’ve focussed more on helping teachers to good and then effectively letting them get on with it. They deserve better and this set of posts is about giving clear help and support to get to outstanding. Time will tell. Thanks for the comment and good luck catching up with your blog reading.